Main Page: To start, I could not get to the management using Chrome or Safari on my Mac. Only when I used Firefox was I finally able to get to the management page. Once logged in I was provided w/ essentially two obvious options. 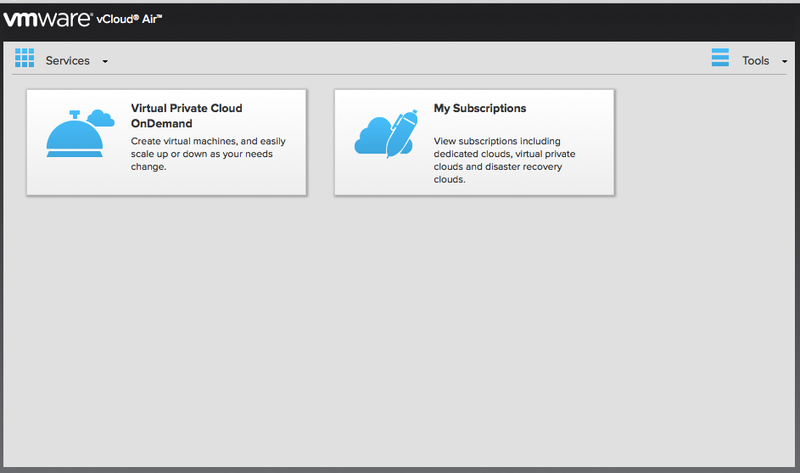 Make a Virtual Private Cloud OnDemand or view My Subscriptions. Once clicking the "Virtual Private Cloud (VPC) OnDemand" option and choosing a geographic location, I was committed to paying 'a cost', just to make a VPC. Technically, I 'get' it, but to charge for what is essentially an imaginary boundary to start with is well, 'petty'. It wasn't really clear what that 'cost' was, but I'll just assume 'beta'. Resource Usage Tab (aka billing): IP billing doesn't make sense to me. My VPC has 461.99 IP's reserved or is that a per hour cost? I don't get it. I'm just going to assume this gets cleaned up and provides more explanation in GA code. This may be a Beta bug, but I wasn't able to see historically what was using storage that I was billed for after I deleted the VM's that were using it. You'll also notice a dropdown for region. If you select a different region that you didn't select upon your original VPC deployment, you're prompted as to whether you want to create one. Uhh, yes? How much is this going to cost me? Doing so, you'll need to wait while it's created. It took about a good 30 minutes for me, but again 'beta'. Hoping GA spins things up much faster. On this tab is where I can create virtual machines and view a list of my created virtual machines. 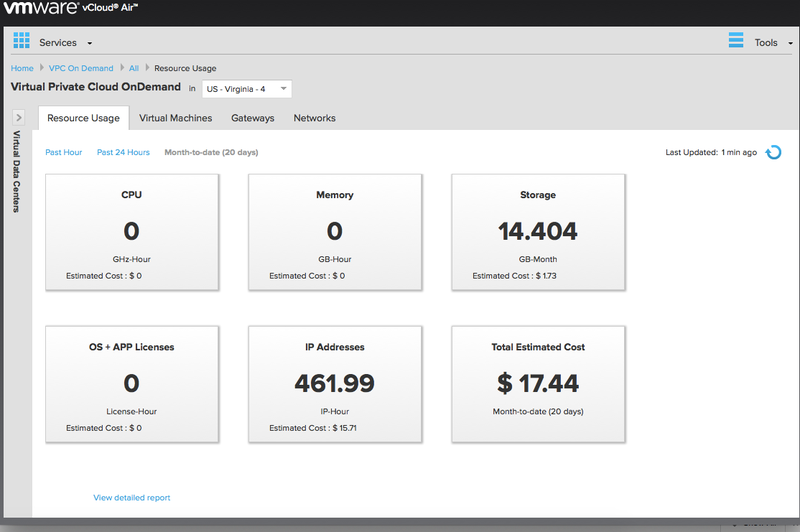 Standard fare, and from here I can manage from within vCloud Director. It'll open another interface for me to do more things. Why? I don't really know. It would be nice to see an addition column where I can simply click to open the VM's console from this view. Even if it is one by one or even a simple screenshot of the current screen. Creating a virtual machine is relatively easy, VMware provides a pretty standard catalog of virtual machines. 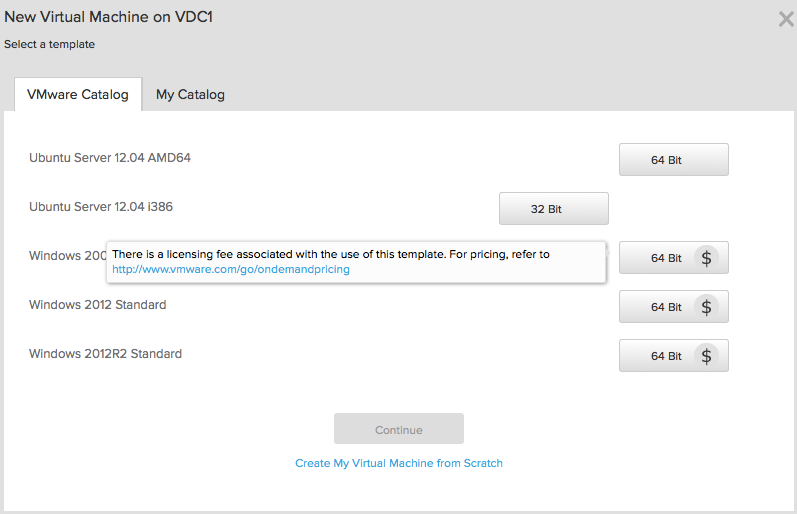 It's also possible to build your own catalog, but that'll forward you to vCloud Director to do so. Not sure if I like that. I understand the 'modular' approach, but not a fan of it from a user usability perspective. Building a Windows VM from the VMware catalog states that there is additional cost for the Windows license, but isn't clear what that price is (possibly due to the beta) Link just goes to generic page. Once you select a catalog item, you are presented w/ the standard sizing options via sliders so you can size the VM appropriately. You can also choose either SSD-accelerated storage or standard spinning. I assume there is a cost difference, again would be nice to see what that is as I'm building it. Would also like to see something to the effect of 'expected performance numbers' and show whether hot-add is enabled or not. 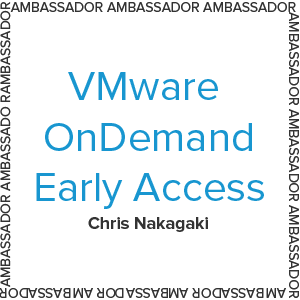 Easier to sell the idea of smaller vm's to start w/ option to grow on the fly as needed. Once done, you're simply presented w/ a spinning circle indicating that vCloud Air is deploying your VM. Progress bar and/or expected 'deployment time' would be a bit more helpful here. Nothing much you can do from this tab beyond seeing your created gateways. 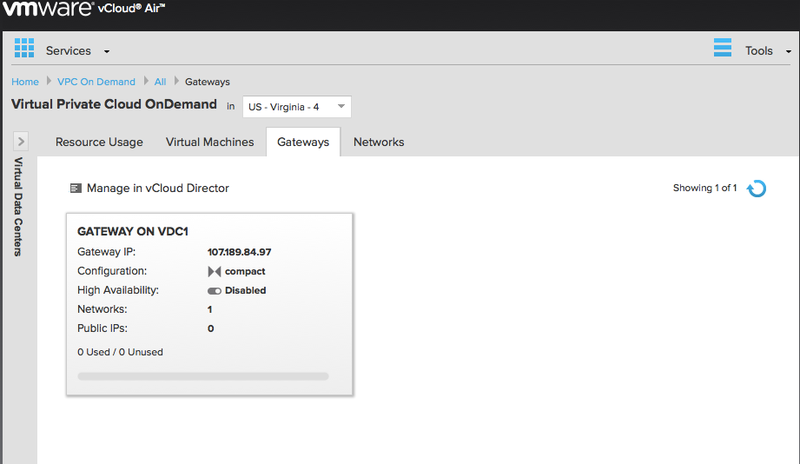 To add additional gateways, you need to jump into the vCloud Director interface. Clicking on a gateway takes you a more detailed view where you can add/edit NAT, Firewall, and Public IP's. 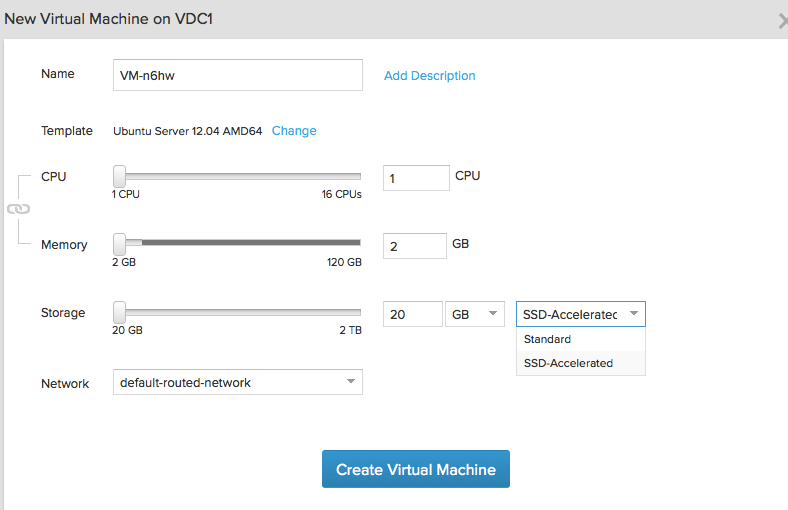 To add additional networks, you'll need to jump into the vCloud Director interface. The good thing about the interface when you do need to jump into vCloud Director is that it is contextually aware. 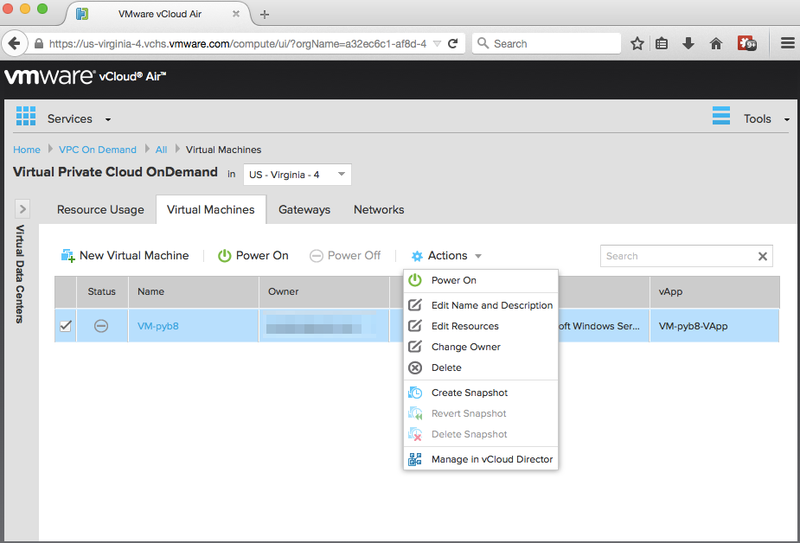 In other words, it will open vCloud Director to the page w/ the related settings. I'm rather mixed. It is dead simple, but it still feels like duct taped solutions in a lot of aspects. I didn't even get into the API, which is REST-ful, simply due to time and the documentation site was giving me lots of java errors. I didn't get the impression that when I create VPC's in multiple geo-graphical datacenters that I could get a universal view of all my VPC's. This would be especially important if I'm creating global service catalogs. As it is right now, I get the feeling that I would have to duplicate effort in two different geo locations. I can't even imagine more than that. To be fair though, I think these are the same kind of problems I have w/ AWS. I also was not able to test the hybrid cloud connector in vCenter. There is also the matter of SSO, I didn't really see if there was a way to connect my onsite directory services to reduce login complexity.